Federal Finance Minister Bill Morneau’s pre-election budget unveiled $23-billion in new spending across more than a hundred different areas – with a focus on new home buyers and training programs for workers – as the Liberals prepare to face voters without a timeline for balancing the books. Stronger tax revenue had the government on track to substantially reduce the federal deficit over the short term, but Morneau chose instead to announce billions in new spending over six years. In the final budget of their mandate, the Liberals stressed the need for government “investments” while gradually reducing the federal debt – a departure from the strategy Justin Trudeau promised on the campaign trail in 2015, in which he vowed to balance Ottawa’s finances by 2019. Mr. Morneau pledged to spread new spending across the economy, with 127 measures that are largely aimed at key voter constituencies such as seniors and young adults, as well as longstanding Liberal priorities such as Indigenous Canadians and refugees. The minister made no changes to personal or corporate tax rates, but eliminated a lucrative treatment of stock-options for highly paid executives at large companies. “I think the most important promise we made to Canadians is that we would invest in the future and that’s exactly what we have done since we came into office,” Mr. Morneau told reporters, when asked about the 2015 commitment to balance the budget. He insisted the government remains on a sound fiscal path. The new measures announced Tuesday add up to $22.8-billion over six years. The budget also books an additional $4-billion in spending that has been announced since the government’s November fall update. 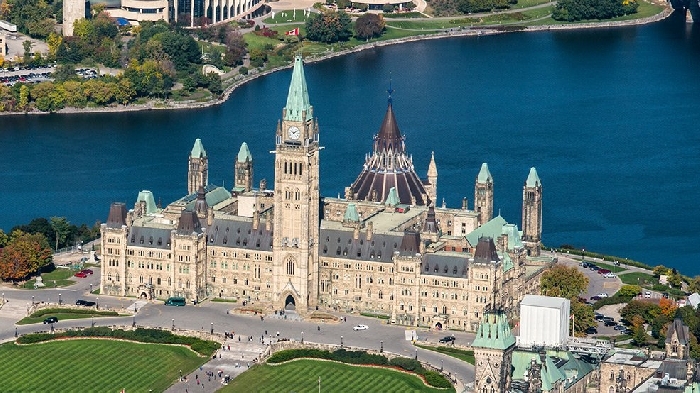 The announcements will force tough decisions on federal parties as they craft their election campaign platforms, forcing opposition parties to accept the planned deficits or campaign on spending cuts. It also leaves the Liberals with limited options this fall. “There isn’t much room for election measures unless they’re willing to increase the deficit,” said Mostafa Askari, chief economist at the Institute of Fiscal Studies and Democracy at the University of Ottawa. The finance minister told the House of Commons that many Canadians are anxious about their futures. His budget targets millennials who have a tough time breaking into the job market or purchasing a home in key markets like Toronto and Vancouver; workers who worry about the impact of new technology, and families who face the high cost of pharmaceuticals. The government was on track to cut its annual budget shortfall to less than $4-billion in five years but Mr. Morneau’s new spending measures will increase the deficit to $6.8-billion that year, not including a $3-billion cushion for risk. In the current year ending March 31, the deficit will drop to $14.9-billion, down from $19-billion last year. It is then forecast to come in higher in each of the next two years, reaching $19.8-billion in 2019-2020 and $19.7-billion the following year, before declining gradually to $9.8-billion by 2023-24, the last year of the government’s projections. One of the major new budget planks is $1.25-billion over three years, starting later this year, for a “First-Time Home Buyer Incentive” that will be managed by the Canada Mortgage and Housing Corporation. The program would see the federal housing agency share the cost of a mortgage with first time homebuyers. CMHC would put up 10 per cent of the price of a newly constructed home and 5 per cent of an existing home, and share in the homeowner’s equity. The more generous incentive for new properties is meant to encourage home construction, particularly in Canada’s largest cities like Toronto and Vancouver, where supply shortages are inflating home prices. Only first time homebuyers with household incomes below $120,000 would qualify for the incentive. The measure would effectively be an interest-free loan that is repayable once the main mortgage is paid off or the home is sold, however many of the program’s key details were missing from the budget document and will be announced later. The budget also increases the $25,000 limit on the Home Buyers’ Plan, which allows first time homebuyers to borrow from their Registered Retirement Savings Plan to purchase a new home. The new limit will be $35,000, or $70,000 for a couple. The government is also adding $10-billion over nine years to a program first launched in 2017 that provides low-interest loans for the construction of new rental housing aimed at modest and middle income Canadians. In a move to address Canadians’ anxiety over a changing workplace, Mr. Morneau announced new benefits under the Employment Insurance system worth $586.5-million per year to pay for training and to help cover lost income when a person goes on a course. The program will allow workers to accumulate credits of $250 per year that can be cashed in to pay for up to half the cost of a course or training program, with a lifetime maximum of $5,000. As well, a worker would be able to collect up to four weeks of Employment Insurance while on leave from their jobs to take a course. The minister also announced new measures to help post-secondary students who take on debt to finance their education. The government will reduce interest rates on the Canada Student Loans and Canada Apprenticeship loans by two percentage points, and add a six-month grace period after a student leaves school before interest starts to accrue. The budget also expands a work placement program to create 40,000 work placements for students within five years. Mr. Morneau also promised the Liberals will flesh out their plans for a national strategy on pharmacare after they receive a report from an advisory committee, headed by former Ontario health minister Dr. Eric Hoskins. In the meantime, he announced Ottawa will work with provinces and territories to create a Canadian Drug Agency, which will use bulk buying power to reduce costs for Canadians. The government estimated it could cut pharmaceutical costs by $3-billion a year over the longer term. The government is proposing to work with other establish a national formulary of prescribed drugs that would provide a standard cross-Canada list for which pharmaceuticals are covered by government plans and private-sector insurance companies.